The Chinese government may be effectively cracking down on some forms of air pollution, but toxic ozone levels are rising rapidly, according to an Unearthed analysis of official data. The country’s average ground-level ozone pollution hit a new high in June, up 11% from the same point last year and 21% from the year before. 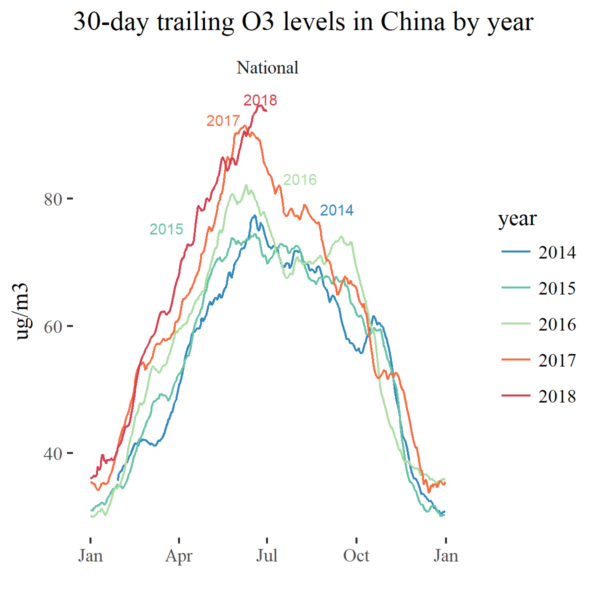 This alarming trend – pollution records were consistently broken in 2017 as well – has seen ozone emerge as an emerging health threat in China, causing 70,000 premature deaths in 2016. While ozone in the upper atmosphere protects life on earth from deadly UV radiation, ozone on ground level is a corrosive, dangerous pollutant that directly harms lung tissue, causing respiratory symptoms and contributing to premature deaths from respiratory diseases. In most places suffering from severe ozone pollution, such as Mexico City, northern Italy or Los Angeles, transport is the dominant source. In China, due to the country’s vast manufacturing sector, both industry and transport are important sources. Ground-level ozone pollution in capital city Beijing increased by 7% in June compared with last year, and levels for the second quarter by 9%. This indicates it could be heading for its worst month on record in July, when ozone levels typically peak, depending on the weather. Neighboring megacity Tianjin already registered its worst 30-day ozone level in June. Beijing’s average ozone level in June was approximately 120ug/m3, while the highest average concentration of 150ug/m3 was measured in nearby Qinhuangdao, the city where the Great Wall of China meets the sea, and home to the world’s largest coal terminal. These levels are more than twice that of the highest concentration found in the US (55.5ug/m3 in San Bernardino, California) and significantly higher than the heavily ozone polluted Mexico City (64ug/m3 in 2017). Ozone is formed in chemical reactions between nitrogen oxides (NOx) and volatile organic compounds (VOCs) in the presence of sunlight. The largest sources of VOC emissions in China are industry and transport; largest emitters of NOx are power plants, industry and transport. Both industrial output and oil demand have been rising in 2018, largely due to a construction surge resulting from stimulus policies. 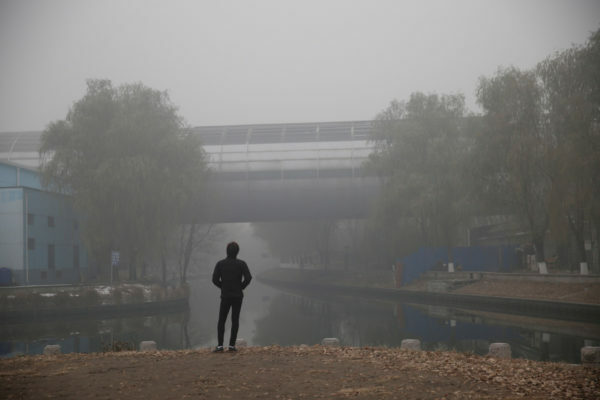 PM2.5 remains the pollutant causing the most harm to public health in China, but rising ozone levels have become a major concern — ozone exposure was responsible for approximately 70,000 premature deaths in China in 2016, according to the authoritative Global Burden of Disease. An increase in ozone exposure by more than 20% in two years can therefore have very tangible impacts on public health. Likely reasons for surging ozone levels include stubbornly high nitrogen dioxide emissions from heavy industry and transport, and increasing VOC emissions from a wide range of industries from petroleum refining, plastics manufacturing and other chemical industries, construction, and from cars and trucks. Increasing summertime temperatures boost ozone formation. While China has made very impressive progress in reducing SO2 and particle emissions, progress on NOx has remained elusive. NOx is more challenging to control with end-of-pipe measures than the two other pollutants, and so far increasing fossil fuel use has offset gains from improved emissions control technology, emphasizing the need for reforming the country’s economic and industrial structure, along with increased efforts to implement and enforce stronger emissions standards. Ironically, lower particle and SO2 levels also increase ozone formation by allowing more sunlight to penetrate to the lower atmosphere. China doesn’t have a target for controlling ozone levels currently, but one could be set as a part of a new national air pollution action plan that is reportedly being finalized. New policy measures include accelerated implementation of new emissions standards.